Optogenetics. It sounds like genes being lit up in neon colors, like a flashy Las Vegas sign. 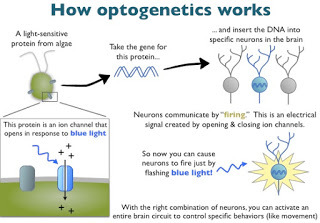 Optogenetics is a technique that takes advantage of proteins found in certain algae species that respond to different wavelengths of light. This algal response to the wavelengths includes opening a channel (called a channelrhodopsin) in their cell membrane, allowing ions like NA+ and Cl– to flow in/out of the cell. Of course ,this is also how neurons operate: they work via the control of certain ions, such as NA+ and Cl-, in/out of the cell. So, if you take a gene that encodes the light-sensitive channel of the algae, and force neurons to express that gene, what do you have? Neurons that have been forced to become responsive to light! Therefore, shining a light on those neurons will force them to fire an action potential (nerve impulse). If you turn off the light, they stop firing. Then, if you use a different channel protein, you can silence those neurons, and they will no longer fire action potentials. This then gives pointed and reversible control over the neuronal action potential activity patterns. The technique’s major asset is the specificity with which you can control gene expression and neuronal firing. This is possible because different types of cells express different sets of genes. Each gene has two major parts: one part encodes for a specific protein, and the other is a regulatory region which instructs the gene on when and where and how much of a certain protein is to be made. These two regions, the encoding one and the regulatory one, are separate from each other. In fact, the regulatory region is on a neighbouring segment of DNA. Therefore, you can slice the DNA that makes up the regulatory region and splice it to the protein-encoding segment of another gene, like a channelrhodopsin protein, for example. Then, you can take that hybrid and stick it into a vector, that is, another organism. What do you think that organism wil now be able to do? Express that protein, like the channelrhodopsin. And that organism will only express the new protein in the cell types directed by the regulatory segment of the DNA you chose in lab. Now, biological research has a history of using light to control or interact with living systems. For example, a light-based technique called CALI is used to inhibit (by destruction) certain proteins. Lasers have also been used to destroy cells. UV light has also been used to activate a protein that regulates neurons. In neuroscience, optogentics can be used to silence or activate neurons in different parts of the brain. For example, the amygdala is involved in fear. Of course, we can be conditioned to be fearful of certain things. Like a man who has a fear of driving over bridges because he was once on a bridge that was damaged, or the girl who has a fear of dogs because she nearly got bitten by one, our fear responses that be strong, and without intervention, permanent. Optogenetics can step in and help us understand the workings of fear, and how it occurs. For example, researchers conducted a study regarding the development of fear associations. Activation of lateral amygdala pyramidal neurons by aversive stimuli can drive the formation of associative fearful memories. This has been proven by taking channelrhodopsin proteins in lateral amygdala pyramidal neurons, and having an auditory cue paired with light stimulation of those neurons, rather than a direct aversive stimuli. After this experiment, it was found that presenting just the tone produced a fear response. It is clear, then, that optogenetics can provide real-time information of what neurons are doing, and when. Further, it can also us to control the workings of neurons. It is possible that optogenetics can get us to the point of not only understanding the brain, including dysfunction, but also offer a way for us to be able to solve problems, including epilepsy and depression. Maybe even schizophrenia.